Since colonizing land at least 475 million years ago, plants have diversified into roughly 290,000 living species. Plants supply oxygen and are the ultimate source of most food eaten by land animals. 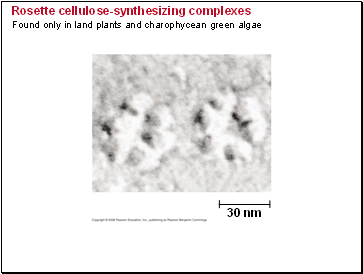 Green algae called charophytes are the closest relatives of land plants. 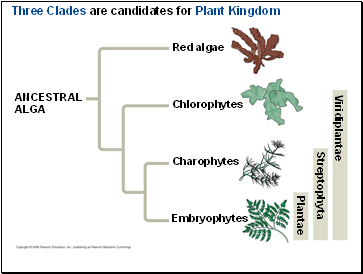 Note that land plants are not descended from modern charophytes, but share a common ancestor with modern charophytes. DNA comparisons of both nuclear and chloroplast genes. Rose-shaped complexes for cellulose synthesis. 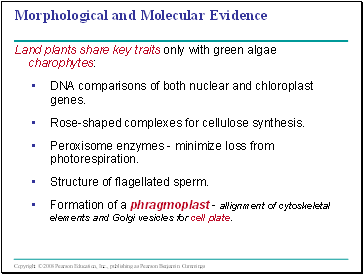 Peroxisome enzymes - minimize loss from photorespiration. Formation of a phragmoplast - allignment of cytoskeletal elements and Golgi vesicles for cell plate. 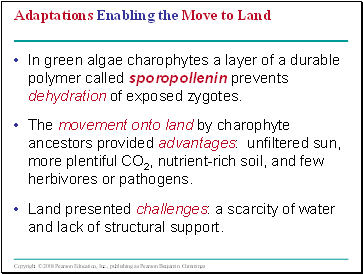 In green algae charophytes a layer of a durable polymer called sporopollenin prevents dehydration of exposed zygotes. 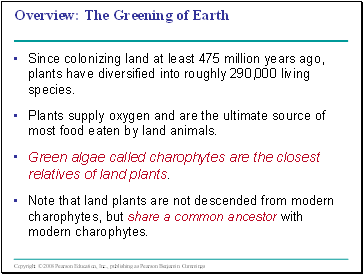 The movement onto land by charophyte ancestors provided advantages: unfiltered sun, more plentiful CO2, nutrient-rich soil, and few herbivores or pathogens. Land presented challenges: a scarcity of water and lack of structural support. A cuticle and secondary compounds evolved in many plant species. Symbiotic associations between fungi and the first land plants may have helped plants without true roots to obtain nutrients. Alternation of generations - with multicellular, dependent embryos. 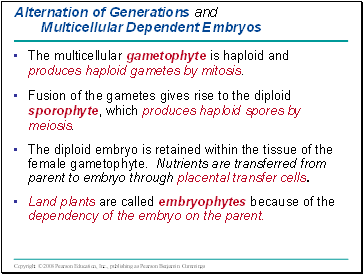 The multicellular gametophyte is haploid and produces haploid gametes by mitosis. 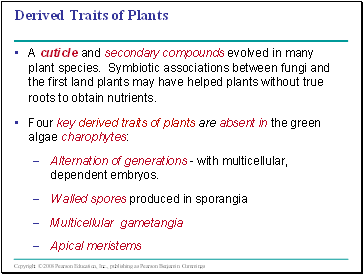 Fusion of the gametes gives rise to the diploid sporophyte, which produces haploid spores by meiosis.